We would like to inform the inhabitants of all Roma settlements that an action to help the dogs will soon take place, i.e. all dogs in all districts will be spayed/neutered. This is crucial in order to prevent further breeding and increase of dog population. Since this campaign will also help the residents of Roma settlements, we are asking for your help to make sure that all dogs are spayed/neutered. Not a single dog should remain unneutered. Spaying/neutering is painless for dogs and has no consequences for the animals apart from stopping further breeding. We are asking for your cooperation because this action is intended to help both the dogs and the Roma community. It is therefore of great importance that you help us catch all the dogs and carry out this action in a peaceful and orderly way. The action includes: catching all the dogs, taking them to be spayed/neutered or cured and then returning them to the spot where they have been caught. Later on, we intend to establish a dog adoption system, but for the moment it is crucial to stop the further increase in the number of dogs. The entire campaign is non-violent and free for all residents of Roma settlements. If you wish to become a guardian of a dog, let us know and the dog will be microchipped under your name. 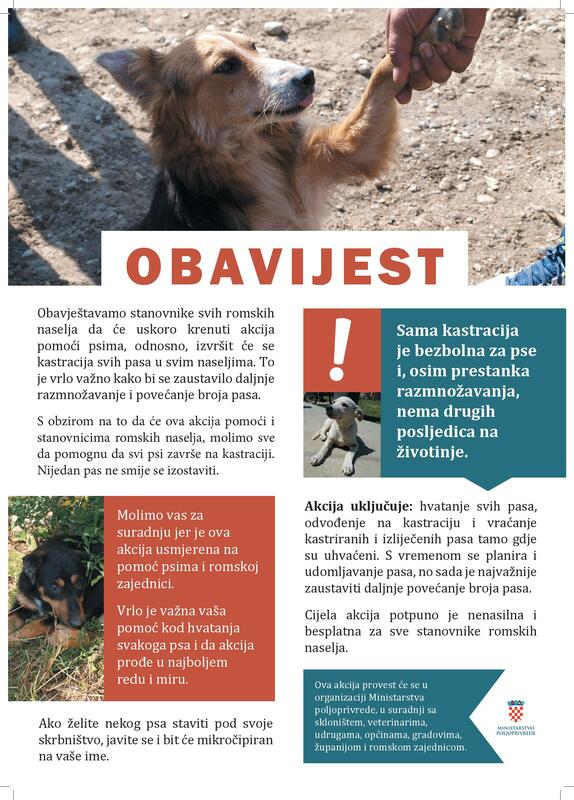 The campaign will be organized by the Croatian Ministry of Agriculture, in cooperation with the shelter, veterinarians, associations, municipalities, cities, the County, and the Roma community.